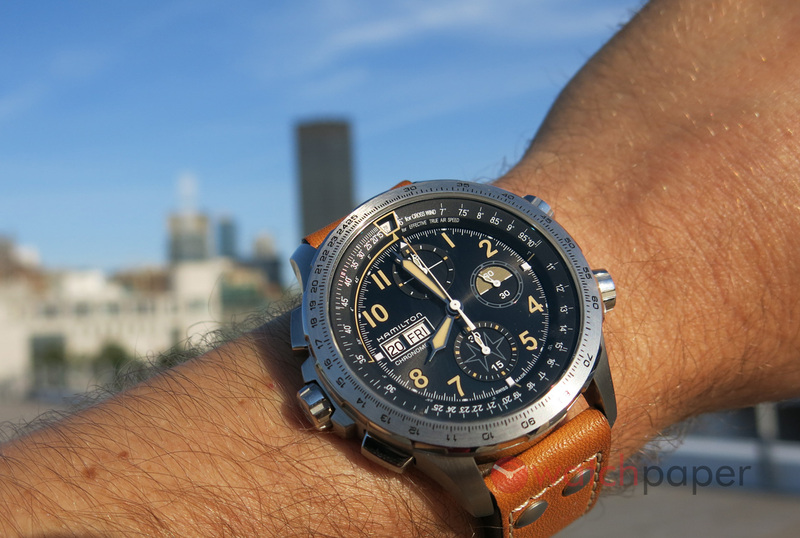 For a watch brand with a long history like Hamilton, every year there is something to celebrate, to remember and 2018 marks 100 years since the brand is involved with aviation. 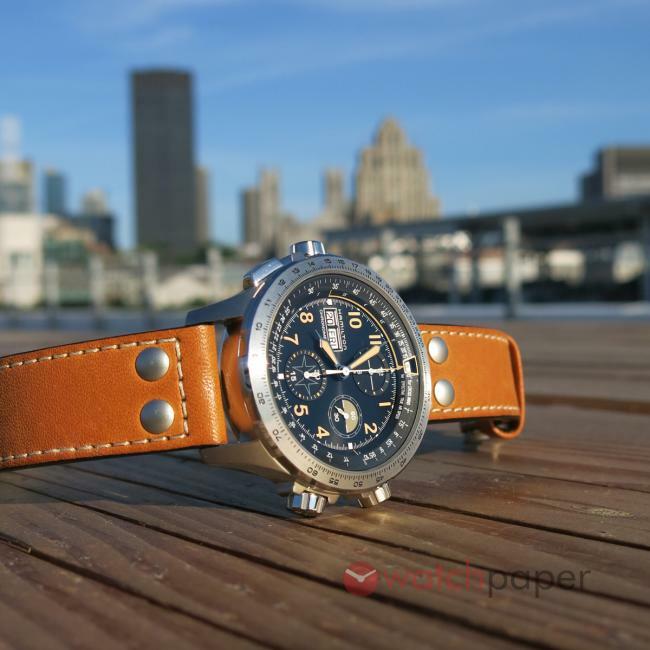 It was in 1918 that Hamilton was chosen as the official timekeeper of the first U.S. Airmail flights and since then, their watches accompanied pilots in several aviation milestones. Today, Hamilton is the official timekeeper of the Red Bull Air Race World Championship, with four of the Red Bull pilots serving also as its brand ambassadors. 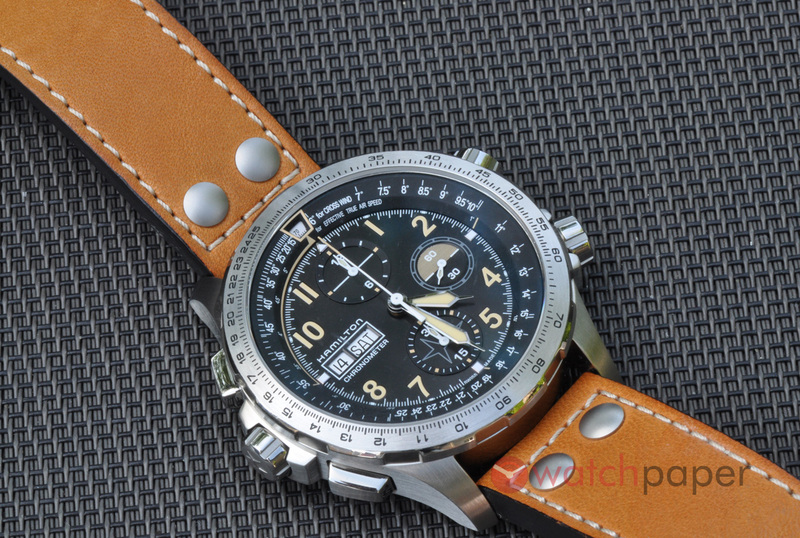 The mark this special anniversary Hamilton released a special edition of its 45 mm Khaki X-Wind Auto Chrono, limited to 1918 pieces. Here in Canada, Hamilton celebrated it with an exclusive event at Toronto’s Buttonville Airport that also included a tour above downtown Toronto in a Cessna. It was an unforgettable experience and you might want to check out my blog post about it, where I also write about meeting Pete McLeod, the only Canadian Red Bull pilot. 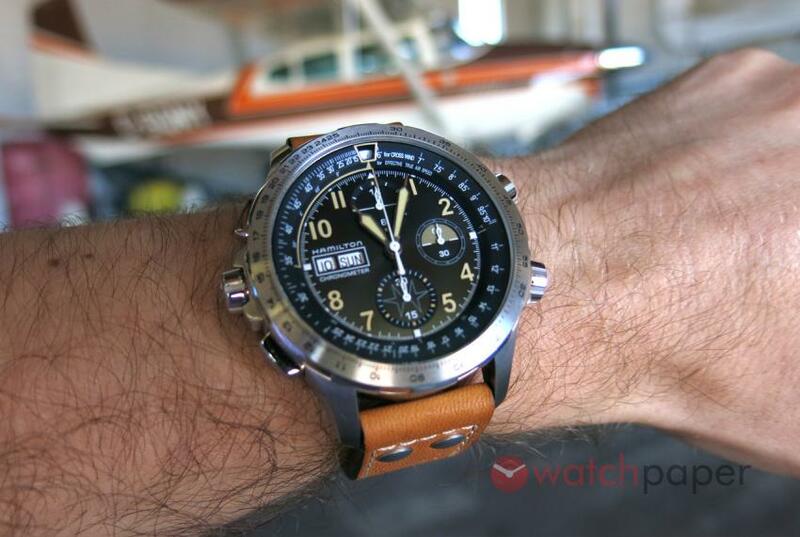 It was there at Buttonville Airport, inside Hangar 3 that I first saw the Khaki X-Wind Day Date Auto Chrono Limited Edition. There were several presentations stands with most of the 2018 lineup of Hamilton watches and as I was going from one model to another, it was this watch that really talked to me. 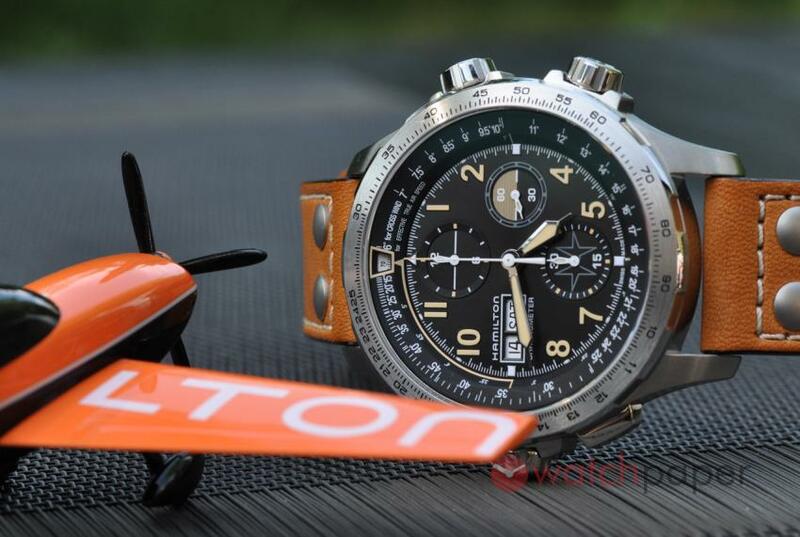 45 mm is way out of my league, with my small wrists, it’s rare that I would dare to try a watch big like this, yet with this X-Wind, I could not resist, it was begging me to bring it along on our Cessna flight. 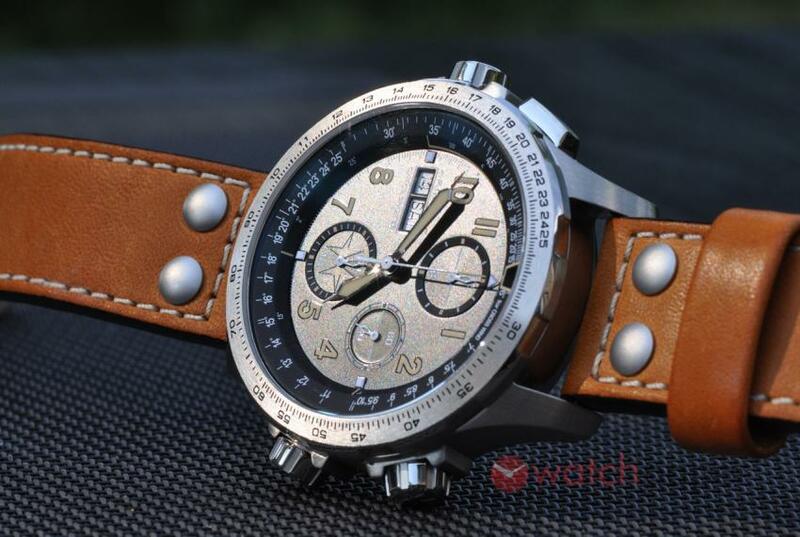 The X-Wind Chrono is not exactly a new concept, it was first introduced in 2014 and I always thought that aesthetically, it is closely related to another cool Khaki pilot/instrument watch, the Khaki Automatic X-Mach from 2009. Since then, through its several iterations, the X-Wind chronographs played an important role illustrating Hamilton’s passion for flying. There was an X-Wind Chrono on the wrist of Michael Peña in The Martian, we could spot another one on Liam Hemsworth in Independence Day: Resurgence, and you can often see it on Red Bull pilots while pulling g’s. 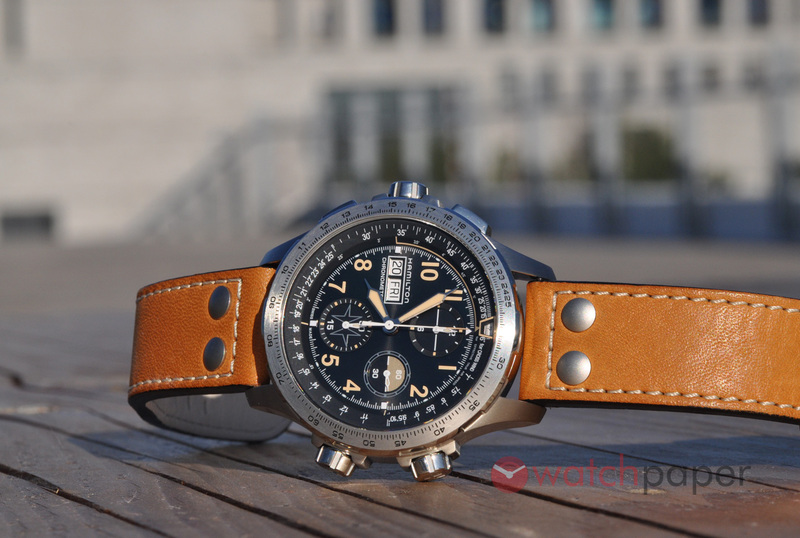 From a technical point of view, the new X-Wind Chrono Limited Edition (H77796535) is quite special compared to its siblings, it is the first Hamilton to be powered by a chronograph movement with silicon hairspring (H-21-SI), giving the watch more protection against magnetism and shocks. It comes with a practical 60-hours of power reserve and the movement is COSC certified! This being said, let me get to the fun part, the design! If you got this far in this review, it is probably because this X-Wind Chrono has piqued your curiosity. Some will find that there is too much action, I even bumped into a watch collector that criticized the dial for being too crowded. It was an eye-opener for me. Up to that point, it never occurred to me that something would be wrong with the dial… I tried to take a critical look at it, but in the end, I still think that the dial is perfect, I still love this watch. This is a tool watch that also happens to pack advanced aviation instruments that I have no idea how to read and I will never need, but they are there to remind me that in life the sky is the limit. From an aesthetic point of view, I tend to disagree with the naysayers. Yes, there are many tiny details on this watch, but they all work together in a visual harmony and this is where I have to take off my hat and bow to the designers. The stainless steel bezel with a black tachymeter scale, followed by the dark grey inner bezel with drift and crosswind calculator, then the dial with its three subdials and day-date window, they all come together in a balanced way. 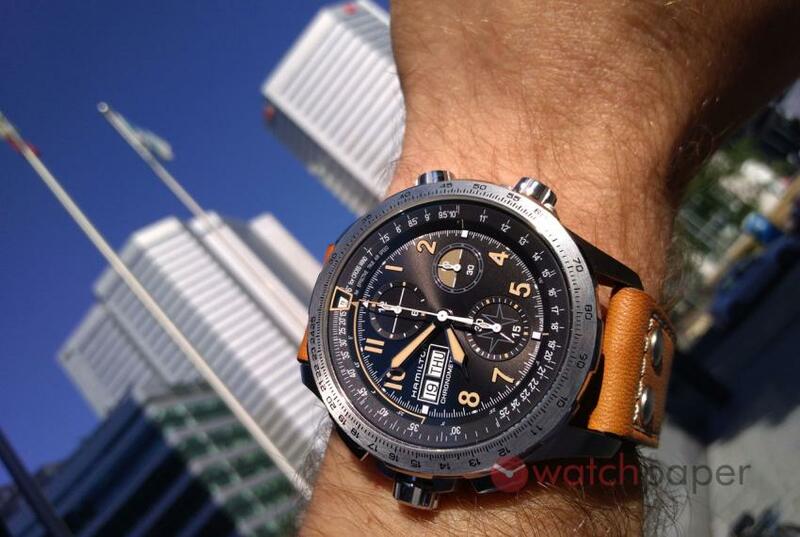 The proportions, the colors, the textures are employed in a smart way to preserve the readability of the dial. Let me give you an example — pilots and fans of aviation will immediately acknowledge that the small seconds subdial at 3 looks like an attitude indicator, with the top half in khaki, while the bottom is black. The shade of the khaki is slightly different from the vintage lume coating of the hands, the difference is just enough to keep the watch in the same chromatic theme without compromising the time reading. I can’t move on without talking about the crystal, the AR coating is phenomenal! Usually watches with a dark dial will always get some reflection and when it comes to taking pictures for a review, it can be frustrating. I had no problem with the X-Wind and a few of the pictures illustrating this review were taken with my phone, which is far from being a top-of-the-line model. Sometimes I would turn my wrist, just to make sure that the crystal is still there. 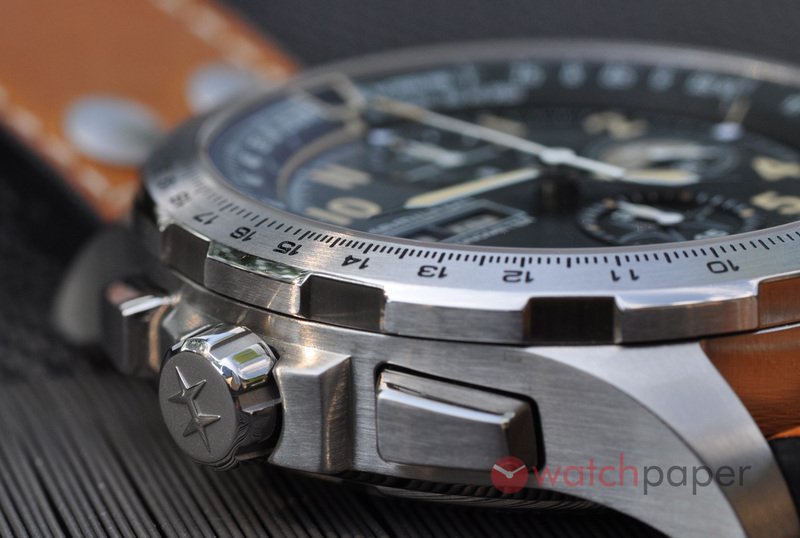 As mentioned earlier, the stainless steel case has hefty proportions and a big presence on the wrist. It has a masculine geometry with strong shapes, starting with the bezel, continuing with the crowns, the crown guards and the lugs, it just oozes power and confidence. Despite its imposing dimensions, it always felt very comfortable, a fantastic sensation for someone with a small wrist like me. 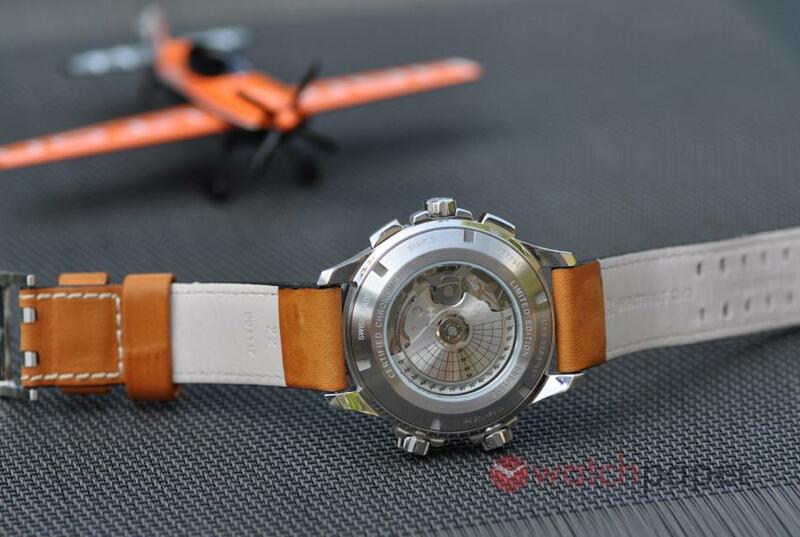 This big boy is matched with a beige leather strap that works perfectly with the khaki-vintage lume theme. The rivets are there to reinforce the pilot theme of the watch and to add even more testosterone to the package. The H-shaped buckle is another very cool touch from the design team. The X-Wind collection, in general, is badass, but this Limited Edition is by far the most beautiful. 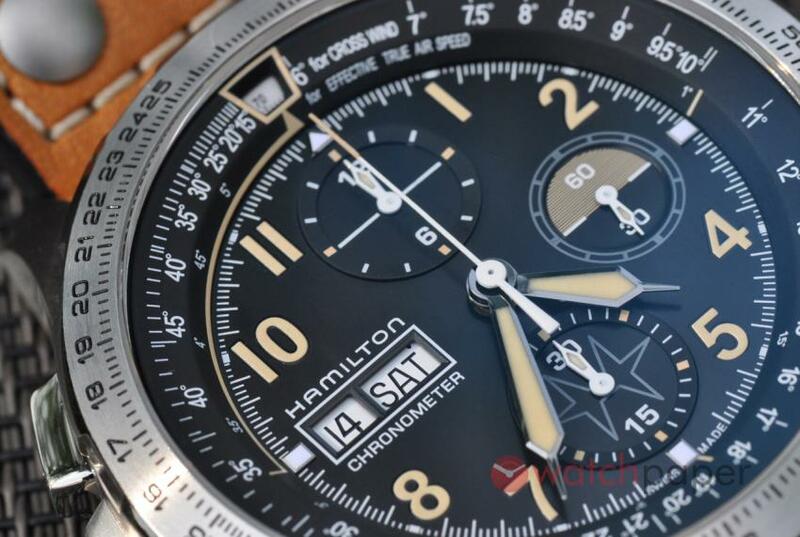 I really don’t know what are Hamilton’s plans with this collection, if they will come out with new versions in the future or not, but I’ll be surprised if they will get the design any better than the 2018 X-Wind Day Date Auto Chrono Limited Edition. In Canada, it retails for $3,250.